I do try to convey that grinding on demand is important because various flavour compounds evaporate from ground beans much faster than they do whole bean and try to explain the difference in grind quality that is available from a burr grinder in opposition to a blade grinder. These are the most tangible reasons to always grind on demand, but other, less visceral virtues are also borne from this small act. Grinding at home you can realise the huge amount the tiniest grind adjustment can make, and also see how brewing a cup in a non-standard fashion can change the cup you experience. You gain a fuller understanding of the processes that happen and can find a personal preference for extraction. 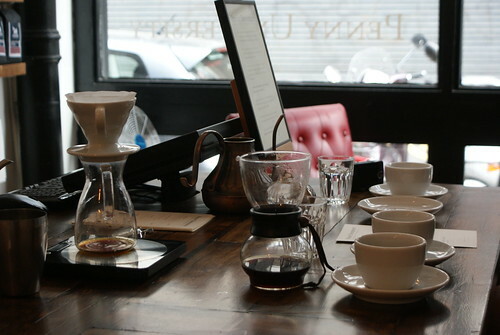 It also opens up the ability to try the same coffee in a variety of different brewers. Most homes have a cafetiere and a good portion have espresso machines. These are two brewers that cannot use the same coffee grind, but given the flexibility of a grinder you can see how a coffee can go from butter popcorn in a cafetiere to cola bottles and lemon drops in espresso (Square Mile’s Sweet Shop blend from this year did this exact transformation). Anyone that knows me, knows I appreciate a beautifully pulled espresso as much as the next person, and though I have an espresso machine at home, I very rarely use it. This is for a multitude of reasons, the largest, simply being the labour in comparison to the end result. For my to pull an espresso, I have to turn the machine on, let it get hot, pull a shot or two to dial in my grinder, get the temperature down (EuroPiccolas have a habit to overheat after a couple of shots are pulled) then pull a shot for myself to drink. Then I have a shot for about 2 minutes. Then I have to clean the portafilter out empty the drip tray and knock box. In that amount of time I could have made and drank a much longer drip or aeropress cup. There needs to be a level where we say that’s enough. I certainly wouldn’t expect every home to invest in a Refractometer, but I think a grinder is the biggest investment that should be made by anyone who classes themselves as a coffee lover. But for the general public I would say that even if not ideal, a good coffee that is bought from a good roaster then preground could be acceptable, owing to that simple matter that the grinder a supplier has available to them will almost certainly be superior in the consistency of the grind than most consumer grinders, additionally the person would have a knowledge of how to grind for different brew methods. We also have to accept that while the consumer may appreciate these great coffees for what they are they may not have the palettes to notice the nuanced difference between a coffee ground immediately prior to brewing and one ground a few days prior, and that’s ok. I’m not making excuses or saying we should stop trying, but as I keep seeming to say, it’s very easy to alienate the consumer to our cause if we get too dogmatic and too pushy. Having most people brewing their own coffee everyday with good results is still a way off, lets get them driving before we ask them to race. Fore-word: I know I may seem slightly odd to post an obituary prior to the closure, but this post is also in part to encourage anyone who has not yet been, to visit Penny University and experience it before it is gone. 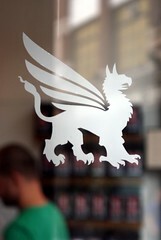 In May, Square Mile Coffee opened its very first retail space project dubbed ‘Penny University’. Partially in order to shake things up in the espresso-centric world of coffee in Central London. The elegantly simple bar featured a state-of-the-art Uber Boiler from Marco and its sister-project Uber Grinder. Beyond that there was nothing you couldn’t expect to see in any coffee enthusiasts kitchen. For various reasons, Square Mile have announced that Penny University shall be shutting its doors for the final time on July 30th. By deliberately omitting the espresso bar concept; the shop has been able to brew coffee in the same manner you may at home, showcasing Square Mile’s coffees and the elegant, quiet simplicity of a manual drip or a syphon brewer. Incase anyone hasn’t had the opportunity to sample some of the best brewed coffee in London a quick run-down. Penny University features three individual coffees from Square Mile’s range and three brewing methods, a Hario v60 (Paper-filtered pour-over), a Hario Woodneck (Cloth-filtered manual pour-over) and a Hario TCA-2 syphon (Paper-filtered Vacuum/Syphon brewer) which are also available as a tasting flight with some exquisite chocolates. The bar has been manned primarily by the charming and incredibly knowledgable Tim Williams and Tobias Cockerill with a few guests at various stages. They’ve worked tirelessly to bring the best coffee to the fore and the role of a brewing barista seems so much more intense than one working with espresso, especially given the level of scrutiny they preside over every drink they make and the level of questions coming from almost every guest within the shop. I had the pleasure of drinking coffee at Penny University three times during its installation and were it more feasible I would have frequented a lot more often. In fact, had it been feasible I would have worked there for free! If you’re in London during the next week I would beseech you to pop by Penny University and give yourself the treat of an excellent coffee. You will not regret your visit! Incase anyone hasn’t yet had the oppertunity to sample some of the best brewed coffee in London a quick run-down. 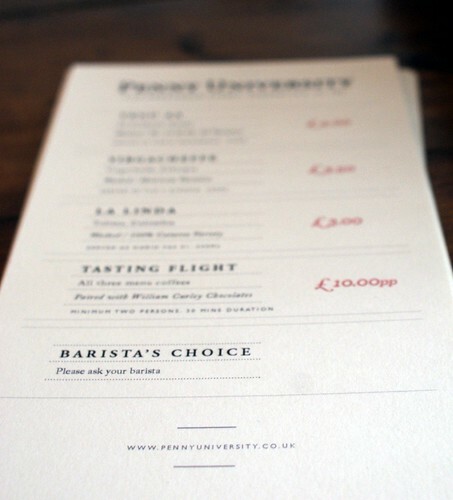 Penny University features three individual coffees from Square Mile’s range and three brewing methods, a Hario v60 (Paper-filtered pour-over), a Hario Woodneck (Cloth-filtered manual pour-over) and a Hario TCA-2 syphon (Paper-filtered Vacuum/Syphon brewer) which are also available as a tasting flight with some exquisite chocolates. Blog-Poll Time: What’s your favourite way to brew coffee at home? Below is my coffee brewing guide as we make it in Gyre & Gimble. Below is my original method which I now consider to be less-good. Grind: Courser than drip, finer than cafetiere but on the course side of things. For a more traditional brewed ration 13g/200ml will give a brew of 65g/Litre ratio, my recipe accentuates the acidity in bright coffees and also gives a thicker mouthfeel. The great thing about the Aeropress is that it’s very forgiving. Play around and find your preference! Final Edit:Make sure the mug you brew into is big enough for the brew. It’s such a shame to waste coffee.. This is a modified recipe from coffee collective..Their recipe calls for 16g/170ml (94g/litre) but personal preference finds me using this recipe. Personally I find Pulped Naturals come out really well in the Aeropress, naturals come out big and punchy and washed are slightly syrupy but keep their cleanliness, but something about pulped works really well with the Aeropress. Any critique on the methodology used is welcome. p.s. Steve, I beat you!